I recently bought two gadgets that are awesome and doing two very different things. The Sony PCM-D50 is an amazing little digital audio recorder that I’ve been using for my work as a radio journalist and audio producer. 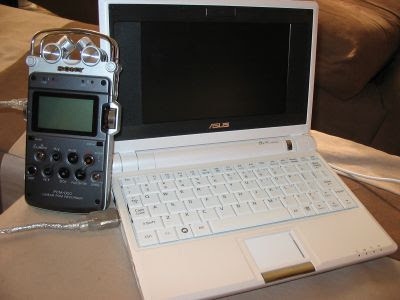 The Asus Eee PC is an amazing little (really little, we’re talking seven inch screen and 2.1 pound weight) PC that I’ve been using for blogging on the go. While I don’t really expect to use my Eee PC for radio production much more than I expect to use my PCM-D50 for blogging, the truth is there is some overlap. Every now and again I record interviews on my digital audio recorders for podcasts, or in some cases as soundtracks to videos I produce for this or other web sites. And the Eee PC is powerful enough to run basic audio editing utilities when I need to make some quick edits on the go. There’s just one problem. While the Eee PC instantly recognized my Zoom H4 recorder when I plugged it in (letting me drag and drop audio files, or even use the Zoom as an external microphone for Skype calls), the Eee PC doesn’t recognize my PCM-D50. If I were running Windows, I could install the driver that Sony includes for stubborn PCs that fail to recognize the PCM-D50. But there’s no Linux driver at the moment. So the best solution I’ve been able to find so far is to scrap the custom Linux distribution that comes with the Eee PC and install Ubuntu. OK, scrap might not be the right word. I’m not quite ready to give up on Xandros. But I’ve found that when you boot Ubuntu (or eeeXubuntu to be specific) from a flash card, the Eee PC recognizes the PCM-D50 as an external hard drive with no problem. As an added bonus, it’s much easier to install Audacity 1.3.3 on Ubuntu than on Xandros. That’s because Audacity 1.3+ is still in beta, even though it’s pretty stable. The newer beta versions of Audacity include a whole bunch of features that are missing in the 1.2.6 version that you can download and install on Xandros. So right now I’m carrying a 4GB SD card around with my Eee PC. It has eeeXubuntu installed, meaning I can boot into either Xandros using the main memory or eeeXubuntu using the flash card. There’s only about 1.5 GB of free space on the card, and even less on the main memory, so I have no plans to do any serious audio editing on this setup. But as soon as the eeeXubuntu developer adds a few more features like support for all the Fn keys on the Eee PC, I’ll probably install the operating system to the computer’s main memory and use the 4GB SD card just for storage, which should provide plenty of space for editing long interviews. I know it’s one more thing to carry, but if running off the SD card with Ubuntu couldn’t you stick a USB thumb drive in to give you more space for editing audio? I haven’t been near a Mac since I bought my PCM-D50, but I would imagine this will work. Honestly, I was surprised it didn’t work with Xandros. But since Xandros places stability over everything, their external storage drivers are probably a few years old. PS. Brad thanks for the great review on the sony…i ended up pulling the trigger on it after watching the youtube vid and listening to your samples…. In Advanced mode, I’ve found that my 701 Eee recognizes the Memory Stick in my PCM-D50, but not the internal D50 memory. It comes up as IC Recorder 2 – which shows one “MemoryStick” folder. No problem dragging and dropping files from IC Recorder 2. IC Recorder 1 is useless though in Xandros. I am using Ubuntu and is not recongnizing my PCM-M10…. I though it would mount without problems.. but nope it didn't. Looking for any tips on how to fix this.